If shutters have been supplied with the property; it is time to secure them in place. Move all furniture away from the windows, cover it or move it to rooms that are least likely to receive damage. Bring inside all garbage receptacles, garden hoses (disconnected from hose bib), outdoor patio plants, pots, chairs, tables, furniture, and pool cleaning equipment, yard flags and other decorations or other items from patios/porches/yards, which may become missiles in a strong wind, to include Holiday decorations. If you are in a waterfront area, because of the possibility of flooding, you need to determine if you should vacate and proceed to the nearest shelter. If you live on the top floor of a condominium or apartment building perhaps you will need to vacate because the roof may be blown off. Do NOT tape windows. If you wish to have boards put up, we can provide a company referral, this would be at your expense. If your property currently has a For Rent/For Sale sign please temporarily bring into the garage. Try to avoid opportunities for water to collect/stand, to avoid increased mosquito activity. Ensure shed doors or storage cabinets are completely closed. 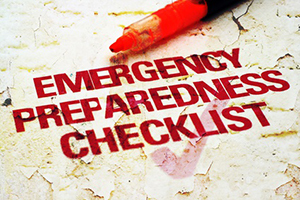 If you decide to ride out any storm at home, be sure to have plenty of drinking water, a portable radio, flashlights, batteries (for the radio and flashlight), a full tank of gas in your car, personal or legal papers stored in plastic bags, first aid supplies, all needed medications, toiletries, diapers, and plenty of pre-cooked canned food-don’t forget the can opener! Other helpful items that we have found useful are rolls of plastic, large plastic bags, cellular phones (make sure they are completely charged), tire repair kits, bug spray, and sun block for after a storm, extra candles and all the laundry washed! Camping equipment is helpful as well as coolers full of ice. If electricity is out for a while you may want to have extra cash as credit cards will not work without electricity. If you are in a condominium complex, you may want to find out what emergency measures have been planned. Some complexes have stand-by generators to assist after storm. Please notify Legends Realty, after the storm has passed via the Tenant Portal if you experience any damage caused by the weather, photo documentation is appreciated.